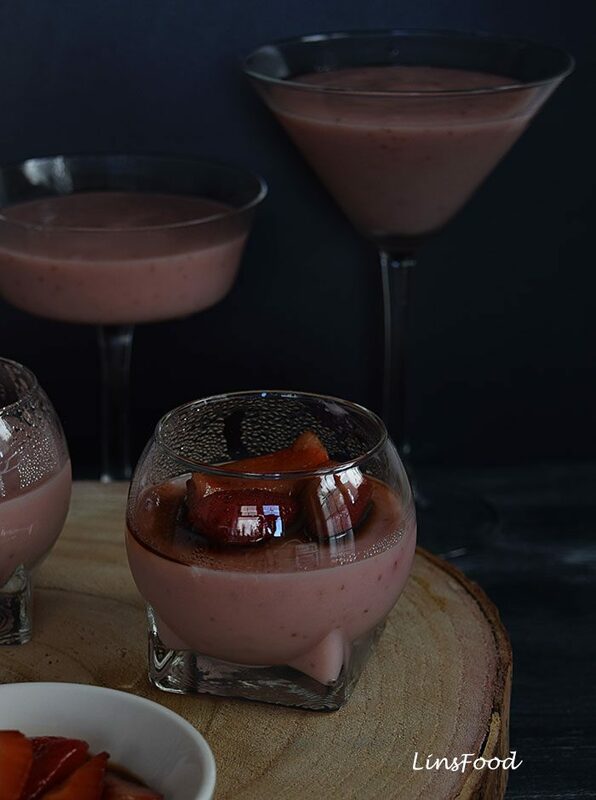 Today’s recipe, Strawberry Panna Cotta with Balsamic Strawberries, is such an obvious recipe for summer, when strawberries are fresh, sweet and cheap! We do grow our own strawberries, but as we only ever have a handful of plants going, it’s never enough to create anything with. They get eaten as soon as they are picked. Italian panna cotta doesn’t need any introduction, really does it? Creamy and jelly-like it is the perfect dessert on a hot summer’s day. And as it really doesn’t take much time or effort to make, and has to be made the day before, it also makes the perfect party dessert. Just don’t forget you need fridge space for all those little panna cotta glasses! – and with vege/vegan gel, it can be vegan too! The name, panna cotta, means cooked cream, in Italian, and that’s exactly what it is! Cream and milk are heated up, and firm up with the use of gelatine. I love using mascarpone cheese in my panna cotta because I just adore it! I could eat a whole tub of mascarpone, if given the chance! We have an old panna cotta recipe here on LinsFood, going back 5 years. Emphasis on the old, meaning I need to get those pictures updated! 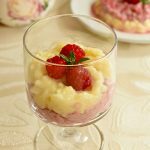 It’s a simple recipe made with mascarpone cheese and adorned with strawberry sauce. 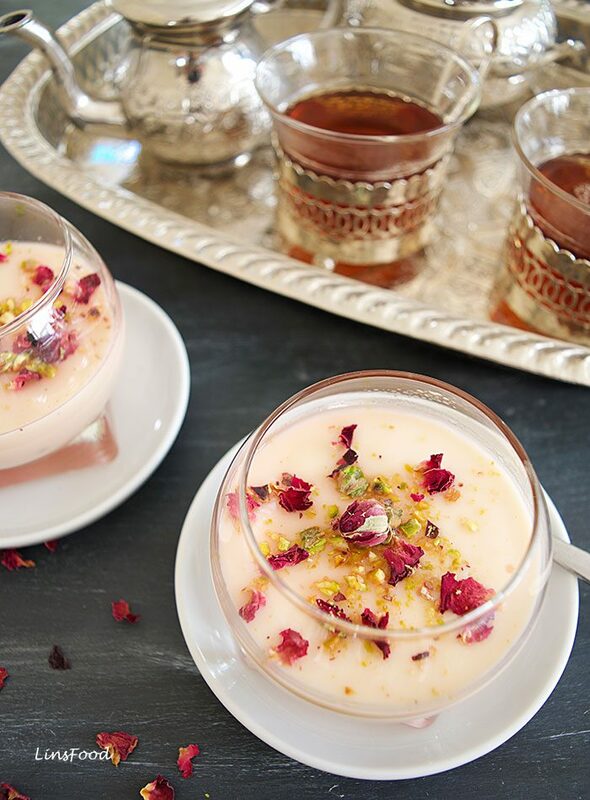 And, we also have a Middle Eastern recipe that I call the Middle Eastern panna cotta. Mahalabia (below) takes minutes to make, and doesn’t use any gelatine. Just milk, sugar and cornflour to thicken. 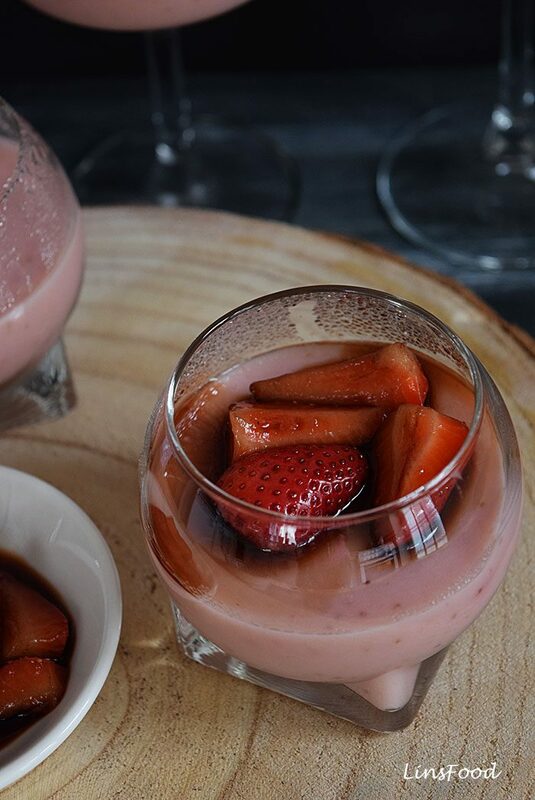 So our Strawberry Panna Cotta with Balsamic Strawberries is very, very easy to put together. Don’t worry about the milk curdling as the gelatine stabilises the whole mixture, and the recipe really is, simplicity itself. If you are vegetarian, look out for vegetarian/vegan gelatine substitute, and follow the instructions on the packet with how much to use in this recipe. Basically, we have about 750 ml (3 cups) of liquid, after puréeing the strawberries. You just need to match the amount of vegan gelatine (or agar agar) to the amount of liquid. Easy peasy. Are just the best! Remember my love for mascarpone? Well, top that with some balsamic strawberries and I’m in heaven! The sweet, tangy and sharp flavour of the balsamic strawberries cut right through and complements anything creamy it’s served with. And that’s exactly what it does to our Strawberry Panna Cotta. However, if you don’t fancy balsamic strawberries with our Strawberry panna cotta, or aren’t sure about it, you can always just top it with some fresh strawberries. Are you a fan of panna cotta, or Italian desserts? Strawberry Panna Cotta recipe, topped with Balsamic strawberries. The sweet, tangy and sharp flavour of the balsamic strawberries cut right through and complements anything creamy it's served with. Pour 125 ml (1/2 cp) of the milk in a wide, shallow dish and scatter the gelatine all over and leave to soak for 10 minutes. Rinse and hull the strawberries by removing the green top and stem with a paring knife or a strawberry huller. Place them in a blender along with the other half of the fresh milk. Blend to a smooth paste. Strain through a fine sieve, pressing down on the fruit pulp to extract as much of the fruit as possible. Combine the cream and sugar in a saucepan and heat gently and bring to boil. Keep an eye on it as it will suddenly rush up! Take off the heat and add the soaked gelatine and stir until dissolved. Pour this hot milk/cream mix into the strawberry purée, stirring well. Pour into 6 moulds or glasses. Cover with cling film and place in the fridge for a minimum of 6 hours, preferably overnight for the panna cotta to firm up well. About 30 minutes to and hour before serving, get the balsamic strawberries ready. Rinse, dry and hull the 12 strawberries. Quarter them and place them in a bowl. Add the balsamic strawberries and sugar and stir well. Cover, and leave aside for 30 - 60 minutes, stirring 2-3 times in that time. If you poured the warm panna cotta into moulds, dip the moulds into hot water for 3 seconds, then invert the moulds onto your serving plates and gently remove the moulds off the panna cotta. No need to unmould if you are using glasses. Top each panna cotta with 8 little strawberry quarters, drizzling a little of the balsamic vinegar on the panna cotta. Serve immediately. Total time does not include overnight chilling. 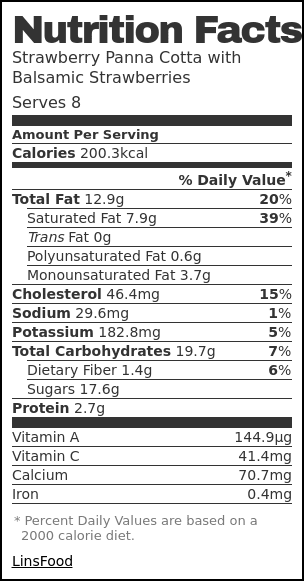 Balsamic Strawberries are made 30 - 60 minutes before serving and also not included in the total time. 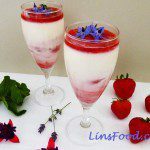 I love everything with strawberries and panna cotta is abosuletly my favorite summer dessert. No baking required, plus it’s so refreshing and beautiful. Wow, what a great dessert!! Oh now this recipe looks fantastic. I love strawberry and balsamic together, they are just a perfect match with flavor. I love balsamic strawberries, I make a tart with them every summer. I cannot wait to try this dish and as a new balsamic strawberry dish to my repotoire. I love panna cotta and adore strawberries with balsamic. We live about an hour from Modena (where balsamic comes from) and I go once a year to buy aged balsamic. It’s divine and perfect with strawberries. Def want to make this recipe! Thanks so much for the idea! I am with you! 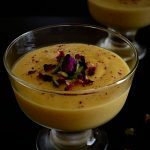 all of those are great points, Panacotta is one of the best desserts ever! 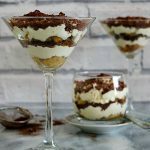 Hi Azlin, this is the perfect summertime dessert – and pannacotta is one of my fave Italian treats! I am so happy that strawberries are back in season!! I have never tried panna cotta before, but I would love to try it sometime! Yum! This sounds so tasty! 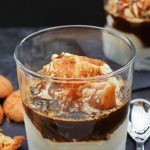 I’ve never had panna cotta before but I might have to try this soon!